Alternative Paving Concepts decorative asphalt coatings and thermoplastics are durable, practical, safe and attractive solutions while being cost effective and quick to install therefore minimizing traffic interruption. These decorative pavement solutions have been installed throughout some the largest cities, commercial developments and residential communities worldwide. 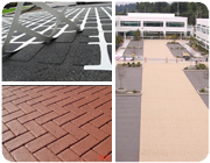 Alternative Paving Concepts provides high performance solutions for any project; such as pedestrian crosswalks, traffic calming areas, bus and bicycle regulatory lanes, playground and recreation spaces, parking lots, corporate logos and community branding. Contributing to more livable and sustainable communities, our innovative streetscape solutions provide visual excellence while affording a highly durable, functional, and the most cost effective decorative option on the market. The unsurpassed choice of color and design gives us the flexibility to create unique projects.